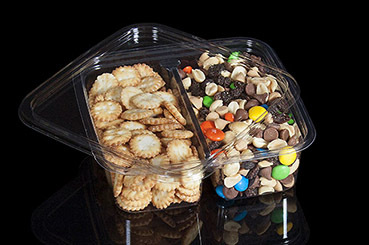 Panoramic Packaging is a leading provider of thermoformed rigid plastic products. We offer a broad array of in-stock "stock line" package solutions, as well as full-service custom package design and engineering expertise. This crystal clear container and lid holds 22 ounces of your treats in 2 cells and measures 6" x 1.75". It features Panoramic’s Perimeter Fresh™ snap closure that locks in freshness. The S-shaped design of this closure system ensures an easy, slip-in snap that securely locks upon closure. The container is produced from FDA approved recycled PET material. PET has crystal clear clarity to enhance product presentation. It also has excellent strength and toughness and is resistant to impact, cracking or shattering.